Members of the cast of the web series, Twentyfishish. The fifth annual Vancouver Web Festival, a three-day celebration of entertainment and programming created exclusively for the online consumption, gets underway next week. Along with workshops, speakers, parties, and pitches are an array of screenings. Among them this year is the Canadian premiere of the web series, Twentyfiveish. Directed and co-written by Vancouver filmmaker, Katie Micay, Twentyfiveish follows five characters who grew up together, but parted ways after high school. Now approaching twenty-five, they meet up for a long weekend at a beach house, where they are forced to navigate their complicated history and examine old feelings and wounds. Having just gone through a break-up with her best-friend, the real-life event not only blindsided Micay, but also helped in creating the series. “So, we started writing from there because friendship breakups are complex and aren’t often talked about. Then we built out the world and all the other characters,” she says. 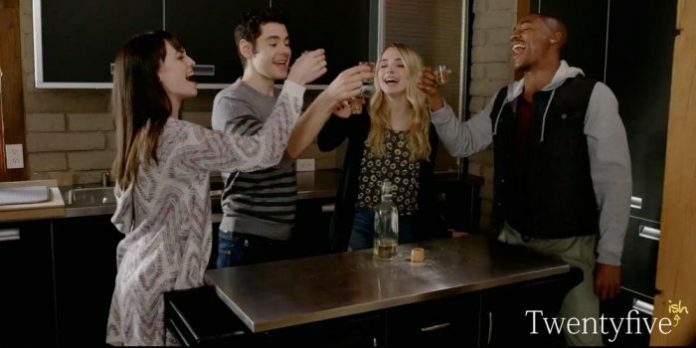 Starring Pretty Little Liars’ Brendan Robinson, the series also features Katelyn Tarver, Ritesh Rajan, Valerie Lucas, and Benjamin Welch. Originally premiering at Seriesfest in 2017, Twentyfiveish makes its Canadian premiere at this year’s Vancouver Web Festival, where it has been nominated in the Best Dramedy category. The 2018 Vancouver Web Fest takes place April 19-21. Visit vancouverwebfest.com for more information. You can also find more information on Twentyfiveish online at twentyfiveish.com.